Small when folded, super comfortable in use! Chicco Miinimo2 closes with one hand and is extremely compact when folded. Miinimo2 is perfect all journeys with your baby in total simplicity. And when Minimo2 is not needed ... it is so small you can put it anywhere! Chicco Miinimo2 closes with one hand, and when closed is super compact and stand alone! Fully reclining and adjustable backrest in 4 positions as well as adjustable leg rest makes Chicco Miinimo2 super comfortable right from birth. 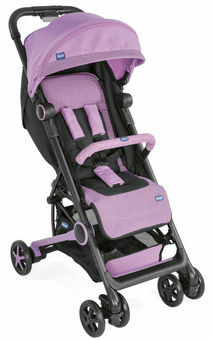 Chicco Miinimo2 comes with a handy adjustable hand strap for maximum mobility in any situation. Bag equipped with handles for storing the stroller when not in use. Practical integrated rain cover for maximum protection even in the case of bad weather.